This short tutorial explains the most common fix for low frame rate. Frame rate is the term for how many frames per second (fps) the system records. The maximum frame rate for the Xbox Kinect sensor is 30 fps. We recommend a frame rate of 28 fps or more. If the frame rate is low on the calibration screen, then a red dot may appear and the system will not scan. This is to ensure good data collection. The cause of a low frame rate is usually because of low processing power of the PC. We recommend an i7 quad core PC, with a dedicated graphics card (eg. Nvidia Gforce 900+). Low performance and low frame rate, indicated by red attention dot. Sometimes the internal graphics card (GPU) and the dedicated graphics card are in conflict, causing poorer performance and a drop in frame rate. Please close all windows of Posture Scan or Movement Lab. Please click on the Windows-Button and select “Settings“ as seen in the picture below (left). Search for the menu option “Gaming” click on it . On the right hand side you will find a link to “Related Settings” called “Graphics settings”. Please click on this. Navigation from Game bar to “Graphics settings”. Navigate to the root folder of PostureScan.exe or paste the file path as seen in the picture below. Posture Scan will now appear on the list. Select “Options”. A menu named “Graphics specifications” will appear. Select “High performance” and click “Save”. Graphics specifications menu. In general the limiting factor, “Power saving GPU”, causes the frame rate problems. This option activates the “High performance GPU” once the software gets started. Please do the same with Movement Lab. You should see the subtitle “High performance” below the software name. Movement Lab and Posture Scan in the list of “Graphics performance preference”. 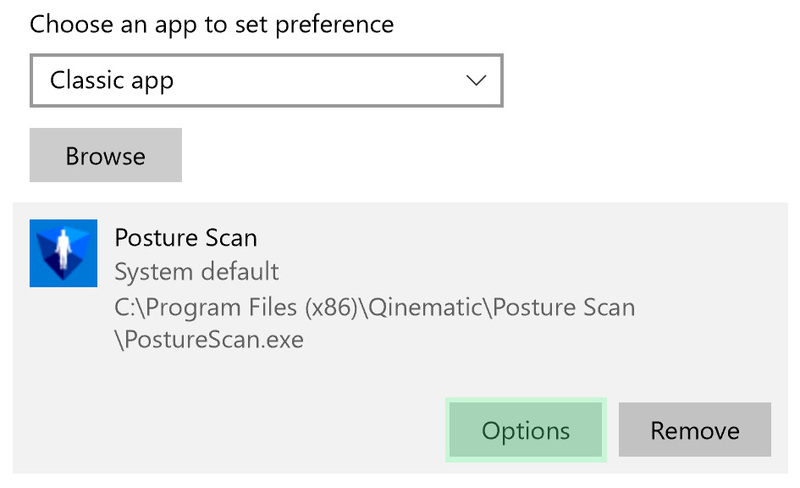 Restart your computer and run Posture Scan. If the frame rate performance is not increasing execute “Solution 2” which follows below. Right-click on the Windows-icon (square in the left corner) to open up a Menu. Choose Device Manager and click on it. [An alternative is to press Windows-Button + R on the keyboard, then type devmgmt.msc and hit Enter. The Device Manager window opens up. Click on the small arrow for Display adaptors. Two adaptors or GPUs should be displayed. Try disabling the internal (Intel) adaptor by right clicking on it. A menu pops-up when you right-click on the Intel adaptor. Choose Disable device. You will be asked to confirm the action. Click Yes. Your screen may become black temporarily. The screen may also change its appearance. For example, the size of the text and some symbols may become blurred. You may need to change Display settings. To change the display, go back to the desktop, right-click any where on the screen and select Display settings from the pop-up window. The following screens will show. Make the appropriate selection from Change the size of the text, apps and other items. Restart Posture Scan and check the frame rate again.